Lately I’ve been obsessing over estate sales. They’re only frequent during the summer months, so I’ve been hunting them down every weekend for the last two months. I’ve found some serious gems this year, including this pretty little mini hutch cabinet, which I refinished to something I seriously love, and just about everything inside of it. That includes a rustic aluminum-cast eight-cup muffin pan, and a ton of beautiful vintage dishes. Speaking of sales, I recently bought the Martha Stuart Cupcake book that I’ve been eyeing for years for over 50 percent off. 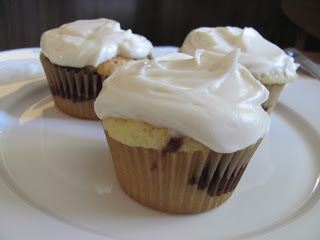 This brings me to today’s recipe; marble cupcakes with cream cheese frosting. I worked on a recipe from this seriously great cupcake cookbook to find the right cupcake for my needs, and used my own fav. cream cheese frosting recipe that you’ll love. Here it is! -In a medium bowl, mix together the flour, baking powder, and salt. In a measuring cup, mix together the cream and milk. Set aside. -In another medium bowl, using a hand mixer, combine butter and sugar until fluffy, about two minutes. Add eggs, one at a time, mixing well between each addition. Mix in vanilla. -Add flour mixture alternately with milk mixture. -To make the chocolate batter; take out one cup of the vanilla batter into another bowl. Mix the hot water and cocoa together, then stir into the batter you set aside. This is your chocolate cake. -Add alternating spoonfuls of chocolate and vanilla cake into cupcake pans until about three-quarters full. Lightly swirl with a butter knife. Bake the cupcakes at 350 degrees for about 20 minutes, or until just golden on the tops. -Mix together the butter and cream cheese with the whisk on your electric mixer. Add vanilla and slowly add the powdered sugar. The frosting will be extremely thick. Add the water to thin, and mix for another two minutes until light and fluffy. Frost away! Note: Don’t feel like you have to buy cake flour. It’s pretty expensive and not really worth the cost. Here’s a great substitute: Measure two tablespoons of cornstarch into the bottom of your dry one cup measuring cup. Fill the rest with regular, all purpose flour, and you have one cup of substitute cake flour.